This recital juxtaposes four significant viloin works from the first half of the 20th century. Poulenc's wartime Violin Sonata, his homage to the executed Lorca, is one of his darkest pieces, its eloquent middle movement deeply touching. Debussy's late violin Sonata is given a beautifully weighted reading, meticulously coloured, while Stravinsky's Suite is invested with vibrant energy. For my money, Prokofiev's Second Sonata, transcribed by David Oistrakh from the original for flute, always sits more happily in its version for violin, particularly when played with the eloquence and sense of space exhibited here. Now in his mid-twenties, Augustin Hadelich is fast emerging as a significant talent. This recital of music of unaccompanied solo violin, however, is a step beyond. The programme is ingeniously topped and tailed by the solo sonatas of Bartok and Bernd Alois Zimmermann. 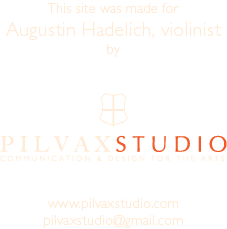 Hadelich plays each with supreme confidence, the colours vivid, his bow control as impeccable as his intonation, the overall shaping always convincing, the direction and balance of line always clear. Between these great columns, he immerses himself in three of Paganini’s 24 Caprices and in the third and fifth solo sonatas of Ysaÿe, proving that he is both a virtuoso violinist and a deeply thoughtful one.